February 24, 2014, 9:20 a.m. The record has stood for more than a century. Not since before the First World War has any party other than Labour or Conservative won a Britain-wide election. Unless something dramatic happens, that record will fall this May. The UK Independence Party is set to top the poll in the elections to the European Parliament, leaving Labour second and the Tories trailing far behind in third place. It could end up as a flash in the pan. UKIP is likely to win few, if any, seats in next year’s general election. But its votes could still decide who governs Britain. So – who are UKIP’s supporters, and what drives them? By combining the results of YouGov’s polls throughout January, we know the loyalties of more than 37,000 electors. They include more than 4,000 people who say they would vote UKIP in a general election – enough to tell us in some detail who they are. Just under half (equivalent to more 1.6m voters) are people who voted Tory in 2010. The rest comprise a collection of far smaller groups: just over half a million former Liberal Democrats, around 400,000 each of those who voted Labour last time, or for UKIP itself, or did not vote. 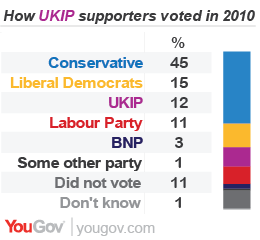 So the Conservatives are by far the biggest losers, but it’s not true that UKIP supporters are mainly Tory switchers. 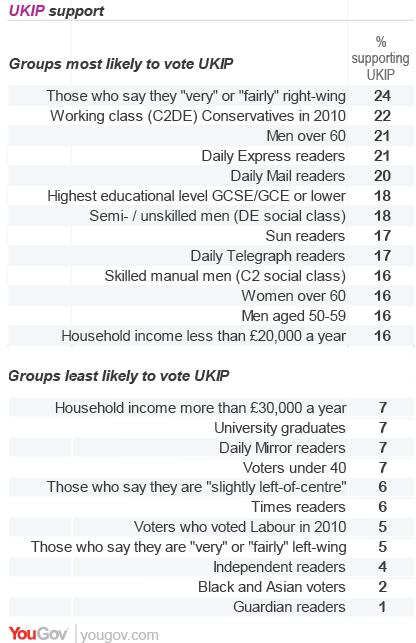 Not surprisingly, UKIP does well among those who say they are “very” or “fairly” right-wing, and among readers of the Daily Mail and Daily Express. But one of the striking things about UKIP is its appeal to older, working class former Tories, especially those who left school at 15 or 16 and earn less than £20,000 a year. They are people who might be thought to be natural Labour voters – but have tended to look to tax cuts rather than social solidarity to improve their lot. Now, five years of squeezed living standards and three decades of mounting inequality and job insecurity, many have given up on all three of the traditional main parties. UKIP has had far less success appealing to better-off voters, graduates and those under 40. These figures relate to UKIP’s steady 12% vote share when people are asked their general election voting intention. When voters are asked about the coming European Parliament elections, UKIP’s share doubles – and that is before the campaign itself has begun: in 2004 and 2009 it gained substantially in the final weeks. UKIP’s extra voters – those who would back the party in the Euro-elections but not a general election – actually hit the Tories harder than their first 12%. Around one in five people who voted Conservative in 2010 currently intend to back Nigel Farage’s party this May (if they vote at all) and then return to the Tory fold next year. It’s plain, then, that UKIP is mining a rich vein of unhappy voters who feel out of sorts in today’s Britain and/or have become worried Conservatives. It’s not just about Europe. This becomes clear when we ask people to pinpoint the three biggest issues facing Britain. Almost two-thirds of UKIP voters don’t mention Europe. They are far more concerned about immigration and the economy. When UKIP supporters are asked which issues matter “to you and your family”, Europe comes sixth in a list of 13, behind the economy, immigration, health, pensions and welfare benefits. UKIP’s rise, then, is a product of a much wider set of discontents than British membership of the European Union. It has also been given the tremendous boost since 2010 of cornering the market in protest votes generally. In past parliaments, the Liberal Democrats would triumph in by-elections and local elections because they were unsullied by the compromises and disappointments of government. Now they are part of the coalition, the world of protest votes is closed to them. Hence the success of UKIP – including winning 20%-plus scores in by-elections in safe Labour seats. Could UKIP build on its recent success, and probable first place in the European Parliament elections, to break through at Westminster next year? This looks far less likely. UKIP’s core problem is the same as the one that used to afflict the Liberals. Its evenly-distributed vote crucifies it under our first-past-the-post voting system for electing MPs. Special local factors might give it one or two seats – and even that’s not certain – but to win many more it needs at least 20% of the national vote. 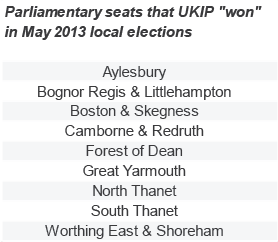 In last year’s local elections, UKIP support equivalent to a national share of 22%. 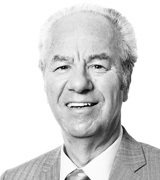 According to an analysis by Lewis Baston, they “won” nine parliamentary seats; that is, when the results of individual wards were added together to create notional results for Westminster constituencies, they came top in nine. All are currently Conservative-held, although two, Great Yarmouth and Thanet South, are seats that Labour lost last time and hope to win back. These nine are now the best hopes for UKIP (along with Eastleigh, where they came a close second in last year’s by-election). However, converting success in local elections into seats in a general election won’t be easy. The real impact of UKIP’s vote next year will be its effect on support for the other parties, even if UKIP wins no seats itself. Disgruntled Tories may not be the only source of UKIP support, but they are by far the biggest source. If UKIP win 10% of the national vote or more next year, then the loss of Conservative votes in key marginal seats will help Labour and the Lib Dems and probably cost David Cameron the election. On the other hand, if UKIP collapses to 5%, then the Tories would be odds-on to remain the largest party in the next House of Commons. Forced to choose, most UKIP supporters would prefer a Cameron-led Tory government to a Miliband-led Labour government. The Conservatives are bound to frighten potential UKIP voters, with the message: “Vote UKIP, get Miliband”. The outcome of next year’s election depends in large measure on how successful that slogan turns out to be.